Make Sure You’re Ready For Winter! Fit winter tyres or use traction aids on your vehicle. Ensure your torch has charged batteries or you have candles in the house. Keep boots, shovels, salt, blankets and food in your car in case the snow hits while at work or on the road. Keep a supply of salt for your driveway, or road if you live on a side road. ...Your Salt May Not Be Up To The Job? Ensure the salt you purchase meets BS 3247 : 1991. This standard ensures that the salt supplied has less than 4% moisture content, and is of the correct thickness for accurate spreading. Beware of the cheaper bags of salt that are available from every street corner during the winter period - they may not be fit for purpose! Great Ideas For The Winter Season. UK weather never ceases to amaze with its unpredictability and although it’s impossible to accurately forecast weather conditions, most experts out there seem to share the view that we’re in for a few years of extremely cold winters because history shows that we usually have a wave of cold winters. Businesses can pay a high price during bad winters. Each time snow hits, it costs the economy billions of pounds in lost trade and absenteeism, which is bad news for the UK’s fragile recovery. As well as hitting consumer spending, it also causes major disruption to many supply chains. It was estimated that in the snow chaos of recent winters, 14% of the UK workforce could not get into work, but only 39% of FTSE 100 companies had the capability for employees to work remotely. Accidents caused by slips and trips triple during the winter months and the NHS often has issues with accident and emergency departments which can get close to breaking point due to increased numbers of patients, combined with staff struggling to get into work. 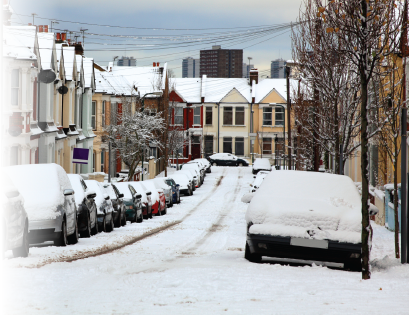 So whatever the weather decides to do, one thing is certain – you can’t afford not to prepare for the worst this winter! Stock up on salt, shovels, spreaders and grit bins. Ensure you have a contingency plan for key members of staff to work remotely in bad weather. Ensure all pathways and routes to the building are kept free of ice and snow in order to prevent accidents. Use entrance mats and warning signs inside the building to prevent slips on wet floors. 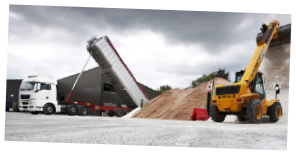 Our new salt bagging and distribution plant guarantees salt availability throughout winter. White Salt - White marine salt is produced from sea water in salt lakes evaporating under the hot sun. The residue salty deposit is then moved to the crystalisation bays, where it stays for up to five years to create a more concentrated form. The salt is washed to remove magnesium and an anti-caking agent is added. For a commercial environment, it is a quick, clean and easy de-icing method for both small and large areas and unlike standard brown rock salt, it does not damage carpets through staining. Brown Salt - Brown rock salt is mined in the UK from underground seams formed millions of years ago. After mining, brown rock salt does not go through a purification process and therefore has mudstone through it giving it the brown look. The effect this has is that when you use the salt on the road there is a brown stain, hence the reason our cars get so dirty when the roads are gritted. In a commercial environment, it is a more economical solution to gritting large spaces such as car parks but can be brought inside on people’s shoes causing staining on carpets, etc. And Finally... - Salt has a low environmental impact when used responsibly. De-icing salt is non-toxic and residual salt is gradually diluted and disposed of through natural processes. Salt spread on the roads usually returns quite quickly to the sea from whence it came and from which it can be recovered when economically viable. Salt used in de-icing can, therefore, be viewed as a truly sustainable resource.